Harness the power of the wind and sail your kayak! 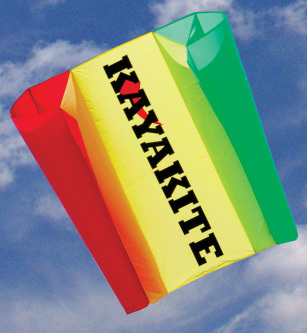 The Kayakite system aids in cross and downwind runs using kite power. Attach the Kayakite to your canoe or kayak and travel farther in less time. Designed for solo paddlers, the sled kite requires no assembly and is easy to launch from your cockpit. Includes an easy to fly sled kite, heavy duty nylon and mesh deck bag, sea anchor/drogue, flying line on winder and instructions.